Keeping my writing organized is important. I think I've found a system. My latest attempt at keeping my writing organized. I have three strikes against me when it comes to keeping my writing organized. Or maybe I have three things going for me. I’m the oldest of four. 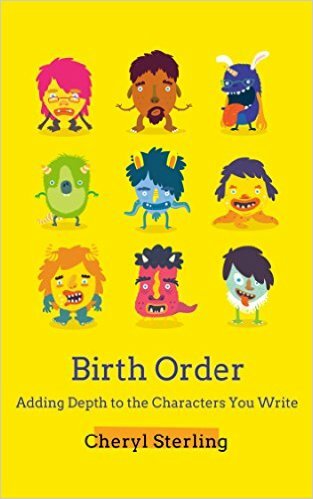 For an in-depth look at how your birth order affects your character, go here for part 1, here for part 2, and here to buy the book I wrote on the subject. 2.I’m a Leo. Per astrology.com, the “Leo-born are natural leaders.” We’re also ambitious and like to get things done. 3 .In Numerology, I’m a “4”, which are the builders. I follow step 1, 2, 3, 4 until I’ve completed the job. (Read my blog post on numerology here). I have Pinterest boards on organization and time management. I’m also lucky enough not to work every day, which—loosely translated—means I can write today. Or tomorrow. Or next week. Despite having an accountability partner (the wonderful Tricia Gunberg), I sometimes scramble at the last minute to get my goals completed and to her to review. Needless to say ( but I’m saying it anyway), I needed a system. I was tired of not remembering tasks, punting, and letting things go because time had run out. Impressed? Don’t be. At least about the physical product. Here’s my secret: I had a big piece of cardboard from a sewing table I bought at IKEA and I found a sale on burlap at Joanne’s. Bing, bang, boom, add a couple of screws, and I created a bulletin board for my wall. On Friday, I pulled off the odds and ends I’d pinned when I wrote my latest book, Brilliant Wreckage, and made a grid from push pins and yarn. 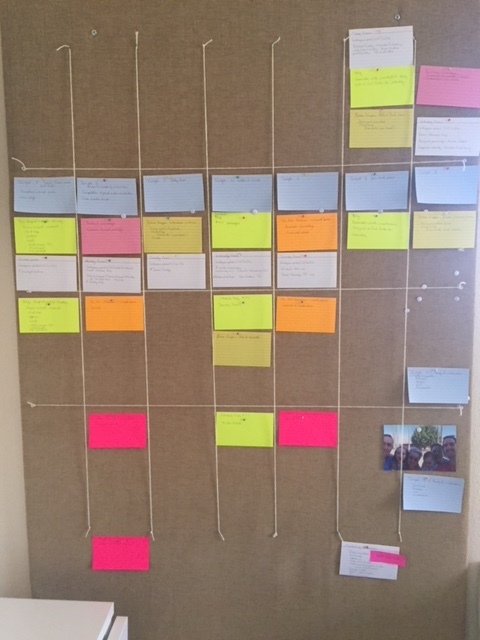 Then I sat down with a pile of index cards and looked at my writing and marketing goals. I spaced them across the board in manageable, actionable steps. It’s been two days, and I’m on track. This blog is my last task for Sunday. I feel good about keeping my writing organized this way. Ask me if the system is still working in two weeks and in two months. (No, really, ask me. I want to be accountable for my accountablity board). I’ve started writing them on index cards I’ve titled “<20 minute tasks”. Forgot to order ink for the printer, or look up one specific piece of research? Jot it down on an index card, and add one or two to YOUR writing board. If you enjoyed this post, please forward it to your social network using the icons on the left. If you’d like to receive my monthly newsletter and receive a FREE short story, please sign up below. And if you’d like to receive my thrice weekly blog posts in your in-box, there’s a opt-in box for that, too. This entry was posted in Writing tips and tagged birth order, IKEA, organization, time management, writing, writing advice, writing goals, writing tips. Bookmark the permalink.